MVU has won national recognition for electric service reliability. The Moreno Valley City hall parking lot now has three Electric Vehicle charging stations for public use. Learn more about MVU and the advantages of a City utility. See how you can save money by purchasing energy-efficient devices. Get secure 24/7 access to your MVU account, payment options and electricity usage tracking. It's fast, free, and available for Apple and Android devices. The Moreno Valley Utility provides safe, reliable, and economical public electric service with a focus on innovative customer solutions, infrastructure enhancement, community development, and environmentally responsible resource management. Pay your bill, start or end service from the your mobile device with the MyMVU app. 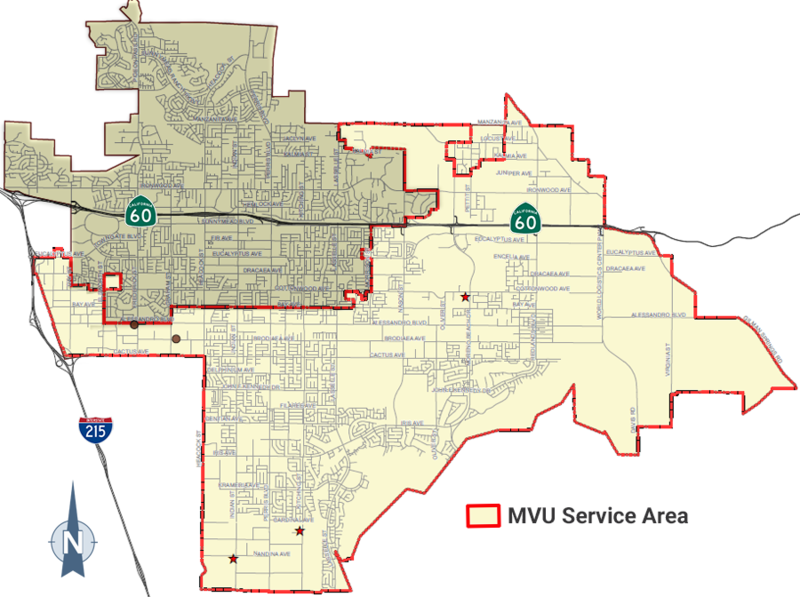 Reside within the MVU service area? Here's how you can start electric service. MVU has solar incentive programs for residential and commercial clients. MVU has rebates to help residents and commercial clients save money on efficient devices. MVU has plans to help with your bill including level pay, medical baseline, and energy bill assistance. The Moreno Valley City Hall parking lot boasts three Electric Vehicle charging stations available for public use. Two of the units are Level 2 chargers that can fully charge some electric vehicles in just four hours, along with a fast charge station, which can provide an 80% charge of an electric vehicle in just 30 minutes. The City of Moreno Valley has been made aware that residents are being targeted by con artists who are impersonating Moreno Valley Utility (MVU) and Southern California Edison (SCE) staff in an attempt to fraudulently collect payments on late electricity bills. MVU does not call customers to demand payment for a late bill. The City of Moreno Valley is currently replacing more than 11,250 high pressure sodium street lights with more efficient Light Emitting Diode (LED) technology. These lights meet the new street light standards while saving taxpayer dollars and making the City more environmentally-friendly. See how MVU plans to expand services in the City while maintaining core values, service, and managing potential threats. Watts Up, the MVU Business newsletter has information about solar programs, discounts and more. Current Energy, the MVU newsletter for residents, is a great way to be informed about MVU programs, policies and programs. Moreno Valley Electric Utility (MVU) was established in 2001 as a publicly-owned utility to serve the growing City of Moreno Valley. The rapid growth of the utility over the last few years has placed MVU in a position to successfully contribute to the economic development goals of the City, helping to attract world-class businesses to the area. Click on the map to see a detailed view.